A special thanks to Laurance P. Lewis for his legal guidance, support and patience! A special thanks to Gracelyn Watkins who, at the age of 9, helped me research the name for this organization! A special thanks to Jacki-Greve Bollendorf for our first donation! A special thanks to the Metea Valley High School cheerleaders for their efforts during the neighborhood shoe drive. They collected 182 pairs of shoes and cash donations. Way to go, girls!!! A special thanks to Chesterbrook Academy in Plainfield for a donation of 115 pairs of childrens shoes!! A special thanks to Goldie Matthew Goldenlox7@aol.com Tastefully Simple and Chris Senne tcsenne@prodigy.net Pampered Chef for hosting our first fundraiser and donating a percentage of sales to Jolly Old Soles. A big thanks to all of our local merchants for their Raffle donations!!!! Menards Racing Ball Cap, zippered tool bag and Menards Pizza Cutter. A gorgeous necklace and African wallet, Thanks Michelle! A big shout out for the students and staff and Pleasant Hill Elementary School, District 200, for a 327 pair donation. The students and staff participated in National Day Without Shoes on 4/10/2012 and went above and beyond in collecting shoes! Way to go!! and Sara Grygiel for setting up a holiday donation box at their shop. THANK YOU! Thanks Cade Nelson for organzing a shoe drive at Sipley Elementary School and collecting 140 pais of shoes! WOO HOO ABBY WISSLER! Thank you for your shoe drive adding 104 shoes towards our 2014 goal. Southminster Presbyterian Church in Glen Ellyn gets big shout out for collecting 300 pairs of shoes to Jolly Old Soles. Thank you so much! Thank you Tommy Walker of Walker Athletics, www.walkerathletic.com, for organizing a shoe drive! 97 pairs of shoes were collected. Thank you so much for your effort and success! 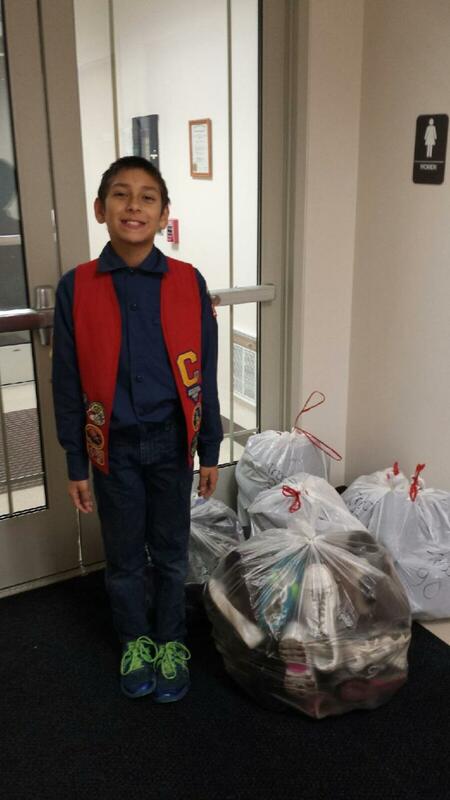 A big shout out to Michael Laba Jr. for single-handedly coordinating a Cub Scout Shoe Drive Resulting in 400 pairs of shoes. Hats off to Troop 111 for collecting the most shoes. A MOMENT IN TIME ESTATE SALES who is generously donating shoes! Thank you.